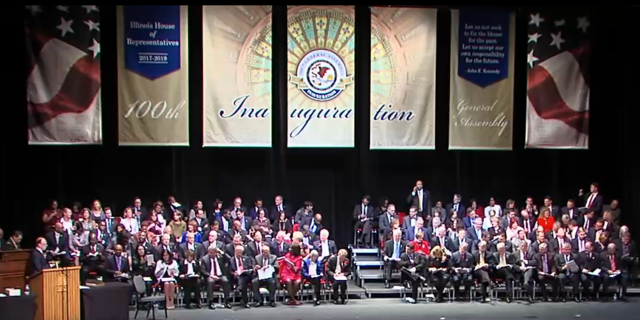 The 100th General Assembly is underway with inaugural ceremonies completed in the House and Senate. 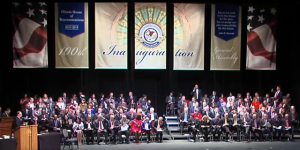 All 118 House members took the Oath of Office last week at Sangamon Auditorium on the University of Illinois at Springfield campus. As always, our first order of business was to elect a Speaker to serve for the next two years. I was proud to nominate Jim Durkin, a true leader with a talent for bringing people together. Those are certainly qualities we need now more than ever. If you wish, you can watch my nomination speech here. In the end, the majority party reelected Mike Madigan, who, with the exception of two years, has been Speaker for more than three decades. For the next two years in the House we will have a good mix of experience and new members with fresh perspectives to tackle our serious challenges, beginning with the budget. House members have already filed more than 450 bills for the new General Assembly to consider. In the coming weeks, our top priority must continue to be working on compromise solutions to get a responsible budget in place as soon as possible. Upon the expiration of the “stopgap” FY17 budget on January 1 authorized State spending stopped on many vital social programs our families and communities depend upon, and for our colleges and universities. Efforts to reauthorize these programs for the second half of FY17 are continuing to be discussed along with the need for real budget reform and true reforms to the Illinois political process. Reform proposals under discussion include a hard freeze on property tax extensions, term limits for elected Illinois officials, workers’ compensation, and other issues. Senate leaders said that they are working to finalize a comprehensive budget plan by February 1. Before the new General Assembly was sworn in, the outgoing 99th General Assembly in its final hours voted to extend for four months the state’s EDGE tax credit program. EDGE, which has served as one of the state’s leading economic tools to encourage employers to locate or expand here in Illinois, expired on December 31st. Senate Bill 513, which passed both chambers by large, bi-partisan margins, extends the program through April 30th while the new General Assembly considers options for its revision and improvement. Governor Rauner has indicated he will sign the four month extension into law. I’m pleased to announce that I will have the opportunity to serve as a leading voice in the House Republican Caucus this year and next. This week I was appointed Deputy House Republican Leader for the new 100th General Assembly by House Republican Leader Jim Durkin. I am one of two Deputy Republican Leaders that help advise the Leader and the caucus. I have been fortunate to have served as Assistant Leader for the past three General Assemblies and I’m honored by Leader Durkin’s continued confidence in my leadership abilities. But what I am most pleased about the opportunity this provides to help advance issues important to families in my district and throughout central Illinois. The challenges we are facing this spring are unprecedented, but they’re not insurmountable. We need to commit to working together to find responsible, compromise solutions.